The engines are not fancy and I don’t think they are intended to be. 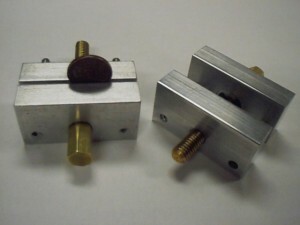 They are easy-to-build proven designs for teaching students basic machining skills. The McCabe Runner, his most popular design, looks a little crude, but the design of the valve appears to be easier to build and more tolerant of mistakes than some engines I’ve seen, such as oscillating engines that use small valve holes which need to be precisely located for them to run well. I’ve got a dumb question. What is a pin vise like this one used for? I like making tools for the shop, and this one looks like it can be made pretty quickly, but I don’t know what I would use it for. one useful idea when you are soldering a wire or jack ,plug the pin vise could hold it for you while you solder away. hi, i did see the plans of your ball turning toolpost with 2 heads, if i’, insterested may i teel whow much it costs.